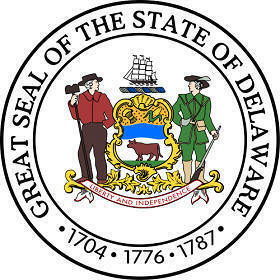 The Delaware state seal identifies government buildings and officials and is a centerpiece for the Delaware state flag. The symbolism, history and emblems of the Delaware state seal are described below with fast facts and information. The meaning of the motto on the Delaware Seal reflects the historical aspirations and concepts of freedom, justice and independence. The motto was added to the seal in 1847. A sailing ship is depicted at The top of the design of the Delaware seal reflecting the ships that carried the settlers to the new colony in the 1600's. 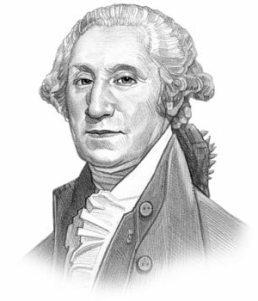 The motto "Liberty and Independence" is displayed on a banner and was suggested by the Society of the Cincinnati, the oldest patriotic organization of American Revolutionary War officers which was formed in 1783. The picture of the Delaware flyer shows the design in 1876 in which the central design dominated by the images of the ship and the ox is flanked by pictures depicting the agricultural lifestyle and industries of the people at the time. The domesticated chickens with the buildings of a new town in the background on one side and the ship building industry on the other side.